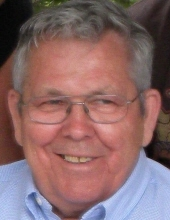 Donald Cyrus “Donnie” Palmquist, born 8/26/35, passed away peacefully at home on 2/3/19 following a short battle with pancreatic cancer. He is preceded in death by his parents Earl and Helen Palmquist, and sisters Donna Rae and Carole. He is survived by his loving wife of 61 years Karen, sons Chad (Christy) and Kurt (Sheryl), and grandchildren Matthew, Megan, Lance, and Lewis. He is also survived by brothers Robert (Nancy) and Roger, and sisters Diane (Bob) Zutter and Patti Palmquist McGarvey (Bob), as well as many nieces and nephews. A celebration of life will be held later this spring at the Chisago Lakes Sportsmen’s Club. To send flowers or a remembrance gift to the family of Donald C. Palmquist, please visit our Tribute Store. "Email Address" would like to share the life celebration of Donald C. Palmquist. Click on the "link" to go to share a favorite memory or leave a condolence message for the family.